This month, we glowingly give charitable recognition to ‘That Suits You’, a creative and empowering non-profit organization whose primary mission is to provide men with professional attire to help them get back to work, provide attire to high school seniors for prom and graduation, and to also provide empowerment training. You can help this organization’s cause by reaching out to them with your donation support. We so appreciate everyone who has donated and helped these men. Men qualify for professional attire by completing training in a job readiness program that we are partners with. Once completed the program contacts us for attire. HOW DOES A PROGRAM PARTNER WITH YOU? Whether they are receiving attire or information we have seen the joy, excitement, and appreciation from all of the men we have served. We could not do what we do without the generous donors all over the nation who have supported us either financially or with professional attire. DONATE Today to help us SUIT and Train more men!!! We currently accept Full Suits, Ties, and Accessories (tie clips, socks, etc). – For NYC residents we arrange a pickup. – Otherwise, we accept mailed donations. Visit www.ThatSuitsYou.org to learn more. 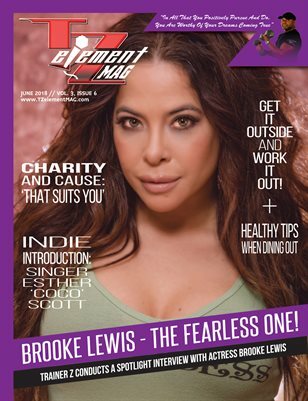 Our June 2018 magazine is available in Print and Digital Download and features an in-depth Spotlight Interview with Awesome Actress Brooke Lewis – The Fearless One! Plus fitness tips, learn about the charitable cause of ‘That Suits You’, and an Indie Introduction for Singer Coco Scott.